First in the series of my experiments with Open Source CMS, today I will write about my experiments with wordpress as PHP developer. I heard about wordpress long ago but have used it on large scale since year 2007. I have created some custom setups so different domains can run from same code base. I have also created lots of plugins to handle content customization, displaying different source content like google maps, creating automated posts with different source database, url customizations and lots of things. I found wordpress very easy to setup, its just few click setup, and in our customization it was just a single click setup for any web site. Creating plugin in very very easy due to its documentation and support for many events and hooks in life cycle of any page. Different page templates is also one of the great feature of wordpress where you can use different design templates for different pages. I am so impressed with wordpress that I have transferred my this blog to wordpress blog. 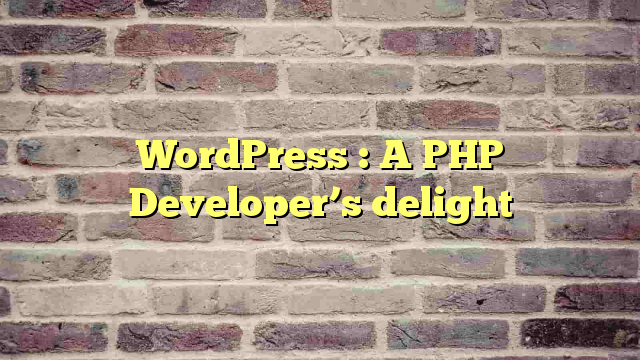 WordPress is blessing for PHP developers. Next Next post: What you should know in wordpress to be a wordpress programmer?